Robert Day is a LibraryThing Author, an author who lists their personal library on LibraryThing. 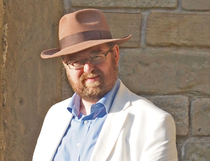 See Robert Day's author page. About meA fully paid-up member of the beard & glasses brigade, I started with science fiction (NOT 'sci-fi', please!) and have ranged far and wide thereafter. As something of a collector of anorakisms, I am liable to be found on a train or a military airbase (with permission, of course) anywhere from the North Cape to the Bosphorous - but always with style. Once a career bureaucrat and default member of the 'awkward squad', I gave that up to try to make my way as a professional photographer and journalist, something which many think merely confirms my precarious state of mind. Along the way, I managed to add a tiny droplet to the sum total of recorded and published history with a book of my photographs of vanished railway infrastructure of the 1970s. This was not a best-seller. In the end, though, sanity prevailed and now I toil in the realm of IT as a tester, trying hard to break something that more sensitive souls have sweated blood over trying to create. In 2009, I answered a speculative social media post from a specialist publisher looking for potential new titles with an idea for a book of photographs of classic railway infrastructure – station buildings, signal boxes and the like - which I had taken in the 1970s and early 1980s. This became “The Lost Railway – the Midlands”, published in 2012, which could have been the start of a series of anything up to eight titles but which ended up as a lone publication, partly because it was a bit unusual even for a railway book (having very few pictures of actual trains in it), partly because the publisher switched editor half-way through the publication process, and as this wasn’t one of “his” projects, he didn’t have the same enthusiasm for it as the guy who commissioned it; and partly because the publisher’s technical team didn’t make a great job out of reproducing the photographs. I still have a number of ideas for books, but they are most probably projects for my retirement years, all being well. About my libraryIt's big. It's multi-lingual. It's eclectic.